Just because the holidays are over, it doesn’t mean you have to stop celebrating or getting presents and BTC Casino knows this. For all those who’ve had little luck winning anything in the many Christmas/New Year promotions most casinos have been running during the past weeks, BTC Casino now offers a chance to take a second shot at warming yourself up with some Bitcoin rewards. If you’re interested in taking that shot, keep reading for more info on BTC Casino’s latest Festive Race tournament. If you’ve owned Bitcoin prior to the fork and got some Bitcoin Cash to spend, BTC Casino can offer you a deal to swap in your BCH for mBTC through a current exchange rate. Bitcoin and Bitcoin Cash are the only available currencies at the casino, for the time being, but you can only convert Bitcoin Cash to mBTC for your deposits and not to actually play in BCH. If you’re new to the casino, you will also be eligible for a first deposit bonus of 150% match. The best thing about this bonus offer is that there are no maximum limits to how much you can claim with it. However, you will have only three days to take this offer when you register, after which it will expire automatically. The wagering requirements on this bonus are set at 35x. There are plenty of games to spend your BTC on at the casino, most of which are provided by NetEnt, Endorphina, and Novomatic. However, if you’re looking for table games, you will only have a limited number of options to choose from as this is mostly a Bitcoin slots casino. On the plus side, registration takes only 15 seconds and you can send money right in within a minute of registering. 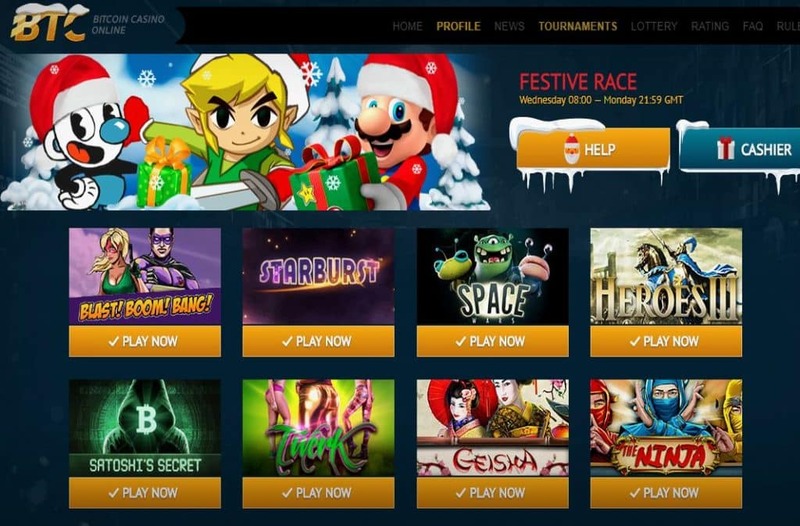 If you’re interested in taking part in the Festive Race or browsing the game offer, feel free to give BTC Casino a visit.